Sword Cold Steel Cinquedea Sword(88CDEA) Sharp medieval swords, two handed sword, viking sword, hand and half sword and others. A wide, stiff cut and thrust blade that could be brought into play in confined spaces, and deliver a mortal wound! Our interpretation of the Cinquedea is made from expertly heat treated 1055 Carbon steel with a highly engraved guard and pommel, and a hand-carved rosewood grip. The Cinquedea is sold complete with a leather scabbard with engraved steel throat and chape. The Cinquedea [Ching-kwi-dey-uh] has held a long fascination for us here at Cold Steel. It gained popularity as the sidearm of choice for noblemen walking through the narrow alleyways and walled cities of Italy. 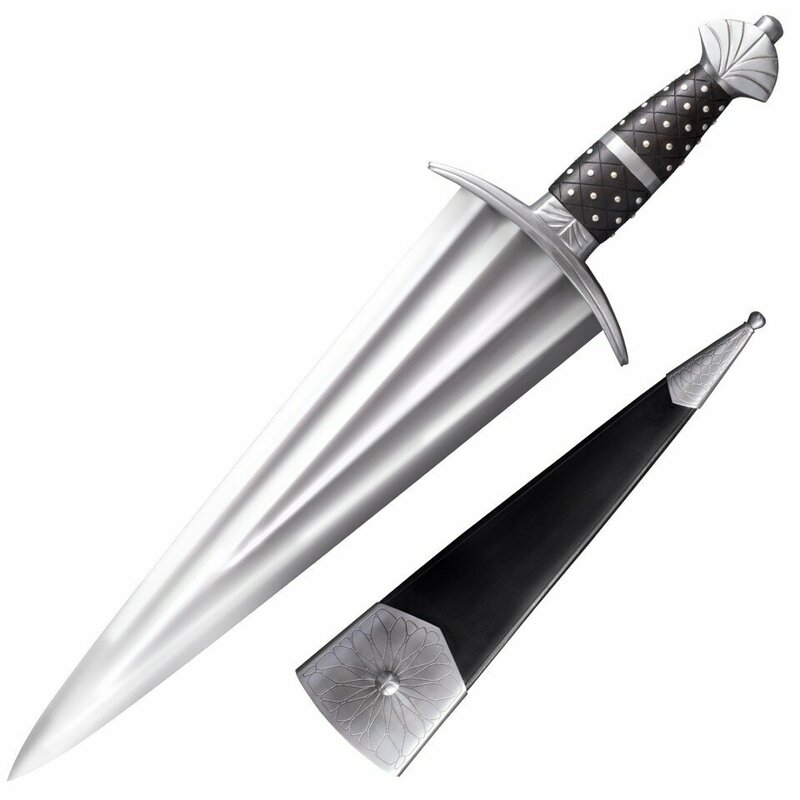 A blade worn exclusively for civilian self-defense, it was essentially the precursor to the civilian side sword and the rapier – and yet, this instrument of personal protection seems to have owed much of its design to fashion as it did to the cut and thrust of mortal combat! Surviving examples of these unusual short handled and steeply tapered blades are often highly embellished and ornate. With etched or gilded blades and deep multiple fullers that border on jewelry rather than weaponry – but beneath the romanticisms of high renaissance fashion lay a tool made with purpose.